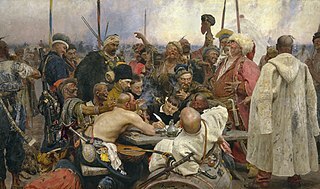 The Truce of Andrusovo (Polish: Rozejm w Andruszowie, Russian: Андрусовское перемирие, Andrusovskoye Pieriemiriye, also sometimes known as Treaty of Andrusovo) established a thirteen-and-a-half year truce, signed in 1667 between Tsardom of Russia and the Polish–Lithuanian Commonwealth, which had fought the Russo-Polish War since 1654 over the territories of modern-day Ukraine and Belarus. Afanasy Ordin-Nashchokin (for Russia) and Jerzy Chlebowicz (for the Commonwealth) signed the truce on 30 January/9 February 1667 in the village of Andrusovo not far from Smolensk. Representatives of the Cossack Hetmanate were not allowed. A truce was signed for 13.5 years during which both states were obligated to prepare the conditions for the eternal peace. Russia secured the territories of the Left-bank Ukraine, Siever lands, and Smolensk. Poland-Lithuania was left with the Right-bank Ukraine, and the Russian-occupied Belarus with Vitebsk, Polotsk, and Dzwinsk. The city of Kiev, though situated on the right bank of the Dnieper River, was handed over to Russia for two years under a series of conditions. The transfer, though phrased as temporary, was in fact a permanent one, cemented in 1686 in exchange for 146,000 rubles. The Zaporizhia was recognized as a condominium of both states. Both states agreed to provide a common defense against the Ottoman Empire. The right of a free trade was granted. A compensation from Russia to Poland-Lithuania of 1,000,000 zloty or 200,000 rubles was agreed on for the lands of Left-bank Ukraine. The transfer of Kyiv to the Russian tsardom had far-reaching consequences. Kyiv, situated in the Greek-orthodox part of the Lithuanian Grand Duchy before the Union of Lublin (1569) and in the Polish kingdom thereafter, was the seat of the orthodox metropolitan, who, despite being formally placed under the Roman pope since the Union of Brest (1596), retained authority over the Orthodox population in Poland-Lithuania's eastern territories. Prior to Andrusovo, Kyiv had been an orthodox counterweight to the Moscow patriarchate, founded in 1589, and since the metropolitanship of Petro Mohyla hosted the Mohyla Academy, that opened orthodoxy to Western influence. The transfer of Kyiv to Russia came only days after patriarch Nikon, who reformed the rites within the Muscovite patriarchate, had won the upper hand over his adversary Avvakum, resulting in an intra-Russian schism (raskol) between the Reformed Orthodoxy and the Old Believers. Kyiv now supplied the Russian patriarch with an academy (after Mohyla's offer to found an academy in Moscow had been rejected) on whose scholars Nikon had relied already for his reforms. Nikon himself, having proposed to replace the Russian simfonia (ithe traditional balance of ecclesiastical and secular power) by a more theocratic model, was banned upon his success, effectively shifting the power balance to the Romanov tsars ruling Russia since the end of the Great Smuta (1613). As the see of the metropolitan, Kyiv furthermore granted Moscow influence on the Orthodox population in Poland-Lithuania. "Protection" of the Orthodox population thus became a future argument or excuse for Romanov interference in Poland-Lithuania. In Ukraine, the treaty is often viewed as leading to the partition of the Ukrainian Hetmanate state between its more powerful neighboring states. From the Polish point of view the treaty is considered a significant mistake that tipped the balance of power in the region and replaced Poland as the dominant state by the emerging Russian Empire. Czernihów (Chernihiv) Voivodeship was a unit of administrative division and local government in the Kingdom of Poland from 1635 until Khmelnytsky Uprising in 1648. Also it was used as a fictitious title in the Commonwealth until the Partitions of Poland in 1772/1795. In 1635, Marcin Kalinowski was the first voivode (governor) of the Chernihiv Voivodeship. The Kiev Theological Academy was the oldest higher educational institution of the Russian Orthodox Church, situated in Kiev, the Russian Empire. The Academy′s predecessor was the Kiev Mohyla Academy founded in the 17th century, in Kiev, then the Polish–Lithuanian Commonwealth. The Bila Tserkva Regiment was one of the seventeen territorial-administrative subdivisions of the Hetman State. The regiment's capital was the city of Bila Tserkva, now in the Kiev Oblast of central Ukraine. Other major cities of the regiment were Hermanivka, Fastiv, Bohuslav, and Skvyra. The Chyhyryn Regiment was one of the seventeen territorial-administrative subdivisions of the Hetman State. The regiment's capital was the city of Chyhyryn, now in the Cherkasy Oblast of central Ukraine. The military units of the regiment were also known as the Hetman's Guard serving as personal guards of the Hetman of Ukraine in 1648–1676. Kiev Governorate, or the Government of Kiev, was an administrative division of the Tsardom of Russia and then the Russian Empire. The government was established in December 1708 as one of the eight guberniyas first created during the Peter the Great reform.